Joe’s experience and fascination with kilns started in the 1960’s while helping his father build the second chamber of the oil fired kiln at Winchcombe Pottery. 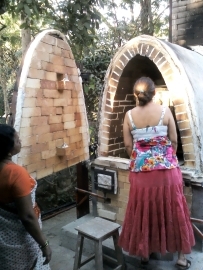 Since then he has built numerous successful kilns, for his own use and for other potters, mostly for high fired stoneware and using different fuels; natural gas, LPG, oil and wood. 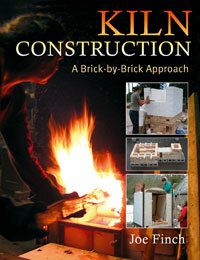 Joe’s book Kiln Construction serves as a guide to kiln building in a user-friendly way. 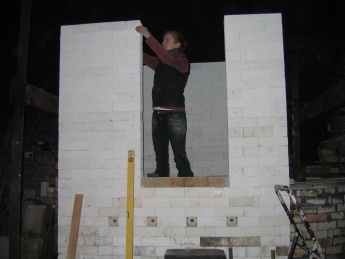 It offers a thorough grounding in the basics and then examines three kilns in depth, brick by brick. These designs, showing gas, oil and wood-fired kilns, have been thoroughly tried and tested and are in regular use by well-known potters. 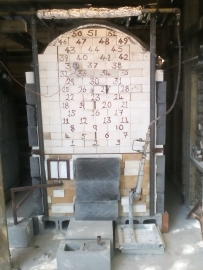 Each of the kilns has diagrams and photos showing every step along the way. Buy it now on Amazon. My book has been reprinted and should now be available NEW for about £20. Joe makes pots for every day use: dishes, bowls, jugs and plates, pots for cooking and serving food, vases for flowers. Practical, unassuming, stoneware ceramics. His pots are ‘raw-glazed’ then ‘once fired’ in a large wood burning kiln that he designed and built himself. He started his pottery career in 1964 with a four year apprenticeship training under his father Ray Finch at Winchcombe Pottery. Whilst learning the more obvious skills such as throwing, glazing and firing, he developed a natural eye for strong, functional forms, and the flexibility to produce pots that are both desirable and affordable. All these factors are still paramount in his work. In 1968 he travelled to Africa where he was sponsored to establish Kolonyama Pottery, Lesotho’s first studio pottery. 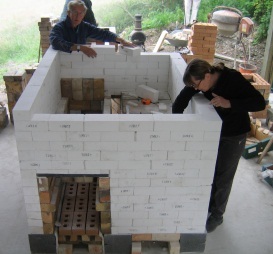 In 18 months, with the help of his wife Trudi, a large oil fired kiln was built and blunger, filter-press, wheels, etc. installed. 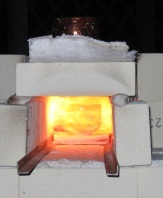 Clays and glazes were tested, six local staff trained and three major exhibitions held. On their return Joe and Trudi worked again at Winchcombe until 1973 when they moved to Appin in North West Scotland to set up their own pottery. The proximity of a sawmill persuaded Joe to use wood as a fuel. His love and fascination of wood firing continues and is now characteristic of his work. During the Scottish winters of 1975 and 1977 they revisited Southern Africa and in 1979 spent three months in Australia. 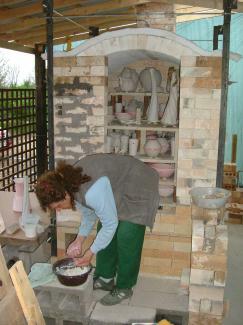 On each occasion they have held pottery master-class demonstrations and ended their stay with an exhibition. In 1980 he was invited to co-manage the Dartington Pottery Training Workshop for six months. 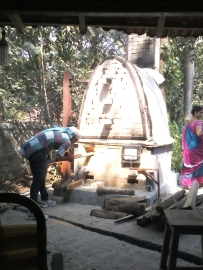 While there he designed and built with the students an efficient oil fired kiln. They moved to Wales in 1984 living first in New Radnor, Powys and then on to West Wales. Here in a workshop converted from a stone barn Joe first made earthenware using an electric kiln. 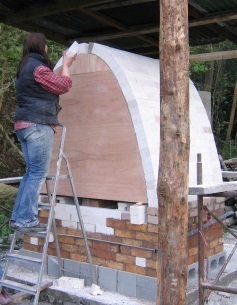 However, having secured a supply of wood he returned to producing stoneware in a redesigned wood fired kiln. Later he added a second chamber in which he ‘soda fires’. Over the years he has demonstrated at many colleges and pottery events throughout the U.K. In October 1998 and April 1999 he was invited to go to India, as part of an aid program, to design and build an efficient wood fired kiln for the Rajasthan potters. In March 1999 he visited New Zealand where he conducted workshops demonstrating pottery techniques to local pottery organizations in Christchurch, Wellington and Auckland. Joe’s experience and fascination with kilns started in the 1960’s when helping his father build the second chamber of the oil fired kiln. 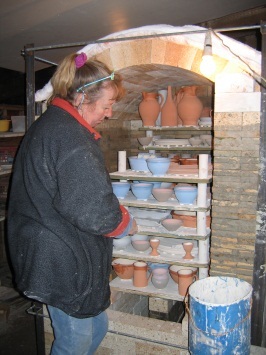 Since then he has built numerous successful kilns, for his own use and for other potters. 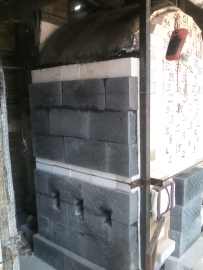 Mostly for high fired stoneware and using different fuels; natural gas, LPG, oil and wood. His favourite kiln is the 60cu.ft. wood fired kiln he has used for many years now and was the kiln he built and fired at the fifth International Ceramic Festival in 1995. This design he has built in Scotland, Wales, England, Ireland and India. It is both easy to build and fire even for novices. 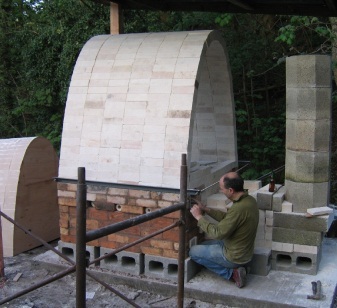 The three chambered kiln he has built at the 2003 International Ceramic Festival is a completely new design, using fire-bricks, insulating-bricks and ceramic fibre. 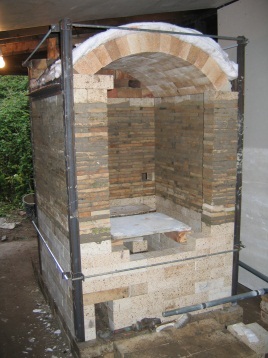 The first chamber being a down-draught kiln fired with LPG until near the top temperature when soda wood is added. The second and third chamber are cross draught, both fired with wood. Easy to build – no need for specialist skills or expensive tools. His favourite kiln is the 60cu.ft. 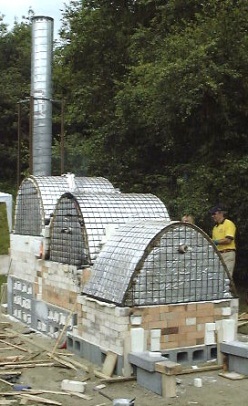 wood fired kiln he has used for many years now and was the kiln he built and fired at the fifth International Ceramic Festival in 1995. This design he has built for other potters in Scotland, Wales, England, Ireland and India. It is both easy to build and fire even for novices. 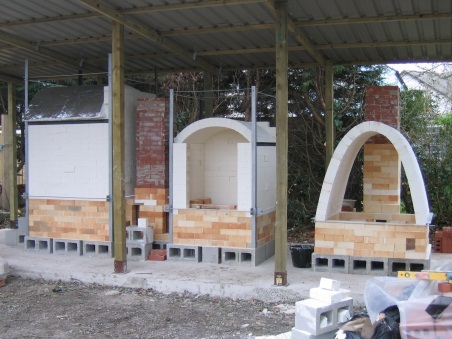 Some of the kilns I have built for other potters, festivals, colleges and pottery associations. Valda Burk. 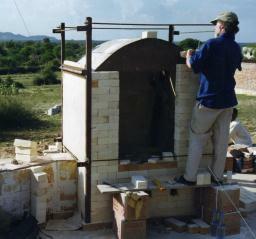 England - Gas fired catenary for stoneware and soda glazing. International Ceramics Festival. 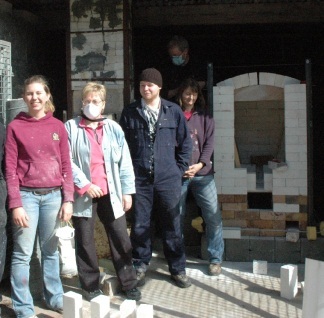 Wales – 2 catenary kilns, 1 gas fired, 1 wood fired. Geoff Jones. 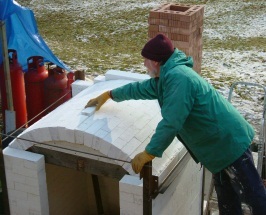 England – Wood fired catenary for stoneware and soda glazing. Anjali Aney - India. 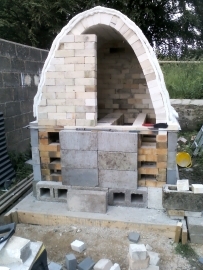 Gas and Wood fired catenary for stoneware and soda glazing. John West – England. Gas and Wood fired catenary for stoneware and soda glazing. St Ives Pottery – England – Natural gas, sprung-arch for stoneware glaze. 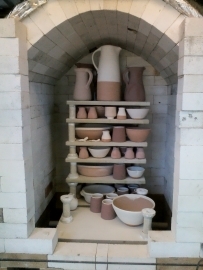 How did you hear about Joe Finch Kilns?